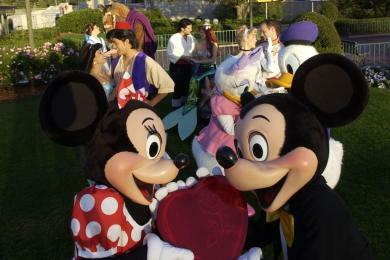 The Magic Kingdom will be staged to proclaiming True Love, with heart-shaped signage and sweetheart-themed decor around every corner. At dusk, hues of pink, red, lavender and blue bathe Cinderella Castle with themed lighting synced to a musical melodies adding to the ambiance. Special enchanting photo locations will dot the park taking advantage of classic romantic Disney spots like the rose garden, and Cinderella's Wishing Well bedecked in True Love's finery. Lovers can also create memories alongside Cinderella's Glass Coach which will be waiting for them by the New Fantasyland Castle wall. A Royal Gathering of Disney Princesses and their Princes will be on hand at enchanting character greeting locations. In Town Square Theater you may find Mickey and Minnie, Aurora with Phillip or Rapunzel and Flynn. Mary Poppins joins Bert in Fantasyland, while Prince Naveen and Princess Tiana meet guests in the Enchanted Glade in Liberty Square. Valentine's-themed Takeaways will be abundant as merchandising offers limited-edition pins, plushes, Vinylmations and newly-designed apparel all celebrating True Love.